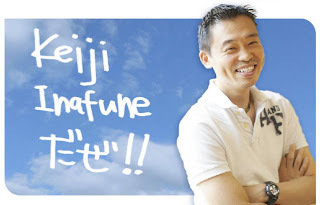 After a period of silence following his departure from Capcom last month, Keiji Inafune, the father of Mega Man and producer behind some of Capcom's biggest titles, has resurfaced, running a new blog aptly titled "It's Keiji Inafune!!" Introducing himself as "Keiji Inafune, without a title", the former producer utilized his first post to give us a brief status update, starting off by expressing his desire to continue making games -- social games, online games, and everything else in between. Beyond that, he's also interested in working on films, books and comics. "I'd like to challenge things that I couldn't do during my salaryman era and greatly exceed my former self," says Inafune in regards to projects outside of games. Inafune says that, now free of his salaryman lifestyle, it would be meaningless to not use this opportunity to try things that he couldn't quite do before. In closing, Inafune isn't announcing any new projects at the moment, but hopes to keep us posted via the blog. Needless to say, it's good to see the guy occupying himself and he seems quite adamant on achieving his goals. As long as he's happy, that's all that matters. Check out Inafune's blog for yourself here. This is phenomenal! This is exactly the kid of news I was waiting for! It's good to see that he's back on his feet again, I guess. I wonder if he'll still be making Mega Man games in the future? Who cares about Inafune anymore, besides the foolish fools who think he actually created Mega Man? He left Capcom, and in essence left Mega Man behind. He doesn't care about Mega Man, or about any of us the fans. I am appalled that MM sites still cover this clown. Well, I love seeing Inafune back. But unless he's going to announce a project really soon, he should have waited to start the blog until he was ready to. Damnit, mans my hero and I dont understand a word he's saying. Best find a translation since learning how to do everything he can as well as read Japanese is just too much. He certainly made the right choice. Inafune, I wish you the best of luck! Obviously, You have no idea on WHY he left. He didnt want to leave megaman at all, It's just that Capcom was going NOWHERE for him. And yes, Yes, YES, We all know that he didnt actually MAKE Megaman, more like, Made him into what he is now. And remember, Legends 3 would have NEVER been THOUGHT of if the FANS didnt ask, Even if it was ten years. Look, I get it, You'll still not like him, But it's obvious your trolling, As its common sense not to post something against another thing, When a whole site is about said thing. Keep your opinion to yourself. They still say that he might still help Capcom, just in different ways. And even then, who is to say that he doesn't care about MM? He probably still does. It'd have to say its the trolls who are the fools, as they could be doing something more worthwhile but instead choose to continue trolling. Maybe he coments about Rockman from time to time! It was the end of an era when he left, but he looks and sounds alot happier than before so I'm happy for him. Someone with his credentials should have little problem getting into whatever game or media company he wanted, so I'm sure it'll go well for him. It'd be great if he had a chance to collaborate with Capcom on something MegaMan again. Until then, I'd like to keep hearing about what he does, just like the ex-Capcom Clover Studios/Platinum Games guys. There is no way Inafune would join with the staff at Platnium/Seed. In case you didn't know Inafune was the one who got Mikami and Kamiya fired from Capcom. There are a ton of articles to prove this. No I won't leak them, and everyone will call me a troll, but I'll give anyone who doesn't believe me a hint. Go to 1up.com and read one of the older interviews with Hideki Kamiya and see for yourself the bad blood between Inafune and Clover's staff. VoiceOfReason - I can think of no reason why you wouldn't link to the interviews you mention, unless you're attempting to troll. Anyway, I was only saying what if it happened. I don't really believe it will. How do you "leak" an article that's already been published?